Introduced by Rolex in the 1930’s, the Oyster bracelet is an absolute classic in every sense of the word. The Oyster is characterized by its long and thick three-piece link design, and is by far the most popular bracelet model available. It has premiered on nearly every Rolex model to date, and has gained a massive following as a result. While its storied history is one reason for its success, many people swear by it for its sheer functionality. The wide center bar makes each link strong and less prone to stretching, so the bracelet is exceedingly durable. Furthermore, the relatively small number of links reduces the number of possible break points. This does come at a cost, however; the reduced number of swivel points makes the strap feel a bit stiff in comparison to other bracelets. 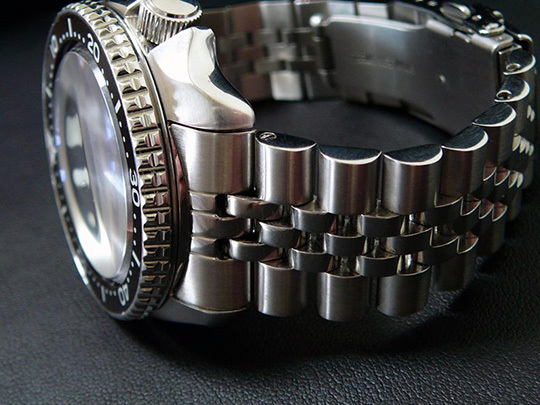 Aside from this minor problem, the Oyster bracelet is a great choice for nearly any watch. The hefty links are often more proportionate on a large watch, but it looks great on a smaller one, too. The Oyster has a vast and interesting history, and it’s not going anywhere anytime soon. If you’re interested in experimenting with bracelets, this is a great first step! Originally worn on the Rolex Day-Date in 1956, the President bracelet received its name from its close association with Dwight D. Eisenhower. As the story goes, Rolex offered Mr. Eisenhower the company’s 150,000th certified chronometer as a token of respect, which he gladly accepted. The relative width of each link piece is similar to that of the Oyster, but there is a drastic difference in the number of total links. The President bracelet is markedly denser than the Oyster, so each link is much shorter in comparison. This eliminates the problem of stiffness, but it does present a potential problem in terms of durability. The increase in total links also leads to a direct increase in probable break points, but this should not be a major concern. You might notice a small amount of stretching after extensive wear, but this depends entirely on the quality of the strap, not its link construction. The President bracelet is considerably more formal than the Oyster due to its compact links. This also increases the strap’s versatility, since it can be dressed up and down more easily. For this reason, it is an excellent choice when versatility is a primary concern. 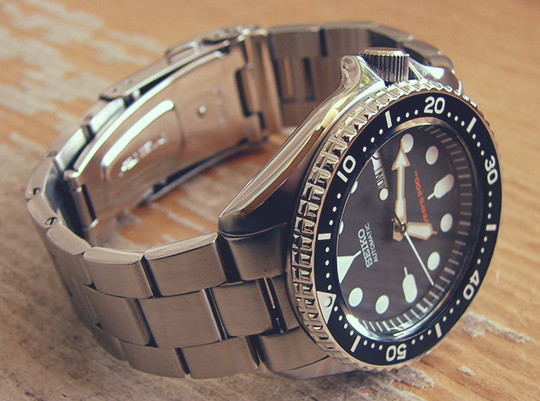 It typically works best with small- to medium-sized watches, but this comes down to personal preference. 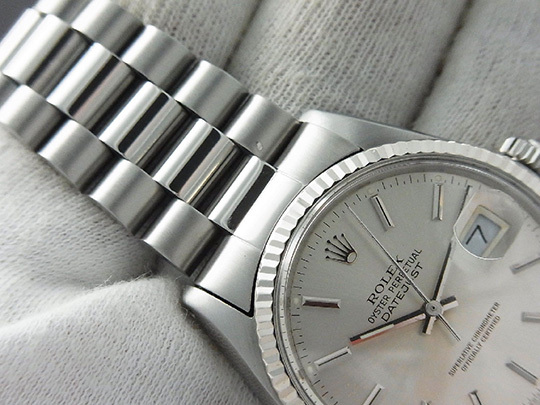 The Jubilee bracelet was first introduced in 1945 for Rolex’s 40th anniversary – it premiered on the Datejust, one of Rolex’s most renowned dress watches. Though it was at first only available in gold, steel and two-tone versions were released soon after. The Jubilee is characterized by three narrow, highly polished links situated between the thick, matte finish side links. The total number of links is identical to that of the President bracelet, but the central portion tends to appear narrower due to its triple-wide construction. When placed on a watch, the Jubilee draws attention to the center of the watch face, minimizing the footprint on the wrist. The two-tone variations exacerbate this effect, especially when the central links are a different color than the watch case. As such, a Jubilee bracelet (be it of mono- or duo-tone construction) is an excellent choice for large and small watches alike, since it brings out the best qualities in both. The only true problem with the Jubilee is its propensity towards stretching over long periods of time. Just like the President, the Jubilee’s small links reduce its structural integrity. After a while, the pins holding each link together tend to expand and loosen, gradually extending past the wearer’s true wrist size. Thankfully, modern construction capabilities have fixed many of the structural problems, so the slightly decreased durability is only visible on vintage models. Unless you put it through some serious abuse, you should never have to worry about a Jubilee strap wearing out.